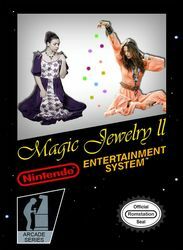 In 1991, Hwang Shinwei decided to follow up this game with Magic Jewelry II, which adds a menu screen allowing the player to start on any of the first 9 stages, make it so that certain colours of jewelry don't give you points, start a 2 player mode which has an optional time limit (the option is called "Flash" for unknown reasons,) and turn the music off. There are more music tracks than the original, and there is an indecipherable voice when you start a game. The title screen for this game is ripped from one of Columns' title screens. As well as this, some of the menu graphics are taken from Hatris and the ones in the 2 player mode bear a resemblance to those from Columns.